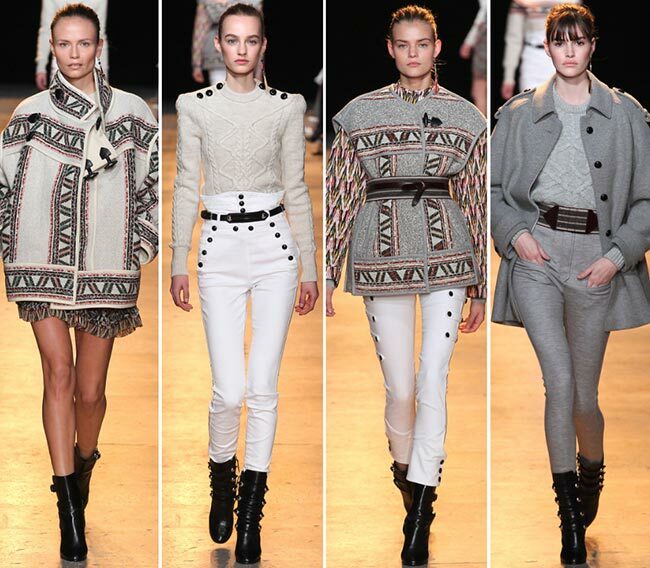 There are so many things to love about the latest collection unveiled by the French fashion house named after its founder, Isabel Marant. We know that this year has been full of the 1980s references and Marant certainly wanted to be dipping her toes in those waters as well, through which she brought us bohemian inspired pieces that included high waists on white jeans cinching in cable knits. There were reworked Bretons and lots of frills down the sleeves and the skirts. We noticed there were some rather huge boyfriend jackets, while the vibes we got were all about staying youthful, no matter a woman’s age. There is an air of nonchalance to be found, a whiff of confidence, a spring in the step that says this is a woman more than comfortable in her own skin. 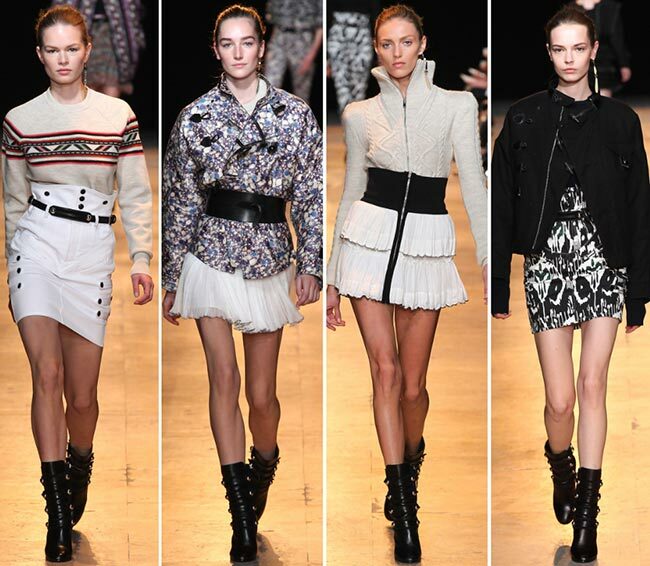 Around the end of the Isabel Marant fall/winter 2015-2016 collection we were given a taste of something new from Marant, presented in the form of sheer white and black swinging dresses that had frothing lace down the front forming into frills. The beauty looks included single earring and strictly pulled back hair from the crown, leaving the features exposed and taut. Giving the face a slight contouring but leaving it bereft of much makeup ensured the models looked as naturally beautiful as possible, their cheekbones high and lips full, the eyes crystal clear and unlined. The footwear is all black leather boots in two particular designs, one of which seems to include quadruple rings in equal intervals up the booties that reach just under mid-calf. In terms of hemlines, we are looking at very short skirts for the most part, while the necks are high despite finding the last few pieces have mesh inserts down the chest to close up the plunging V necklines. The collection includes black and white, navy and grey, a touch of red and very little brown used in some of the patterning. While most of the hair is pulled back in a strict fashion from the crown, some of the models do sport rather pretty fringes that we absolutely adore and may just decide to emulate, particularly when we get our hands on some of these outfits with the miniskirts. Judging by the loveliness of the lines, the lack of awkward embellishments and full understanding of the fashion world, it becomes hard to imagine that the fashion house is only about 21 years old, having been established in 1994. It has certainly moved on from simply jerseys and knitwear, becoming popular for its shoes and turning into a favourite for many celebrities, including Kate Bosworth, Katie Holmes, Anne Hathaway and Hilary Duff. It certainly is nice to see that there are shops in not so expected places like Beirut, despite the brand’s limited number of shop locations. 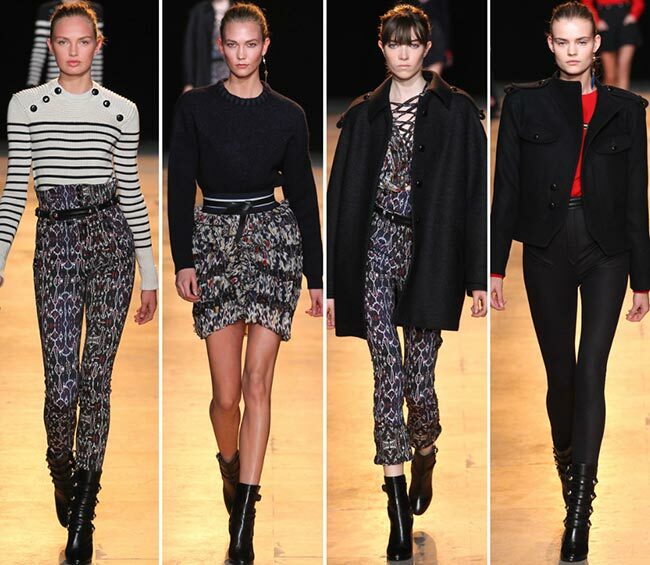 To date, the Isabel Marant pieces have been described as androgynous chic and with bohemian nonchalance, both traits appearing quite nicely in the Isabel Marant fall/winter 2015-2016 collection presented today on the Paris Fashion Week runway.